Sony VAIO PCG-3xxx Series. Sony VAIO PCG-5000 Series. Sony VAIO PCG-6000 Series. Sony VAIO PCG-6xxx Series. Sony VAIO PCG-700 Series. Sony VAIO PCG-800 Series. Sony VAIO PCG-8000 Series. "CTRL" "F" to find your laptop model/part number printed on your laptop bottom or original adapter. Sony Vaio VGN-NR Series. Sony Vaio VGN-S3 Series. Sony Vaio VGN-S4 Series. Sony Vaio VGN-S5 Series. Sony Vaio VGN-SZ Series. Sony Vaio VGN-AX Series. Sony Vaio VGN-BX Series. Sony Vaio PCG-700 Series. (1 Adapter 1 Power Cord （UK Plug). Such as battery, ac adapter etc. (Apply for Battery Only). We will very appreciated for your doing. Our 100% item locate UK Local warehouse. excluded.). 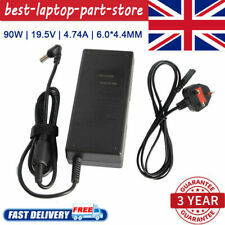 (1 Adapter 1 Power Cord （UK Plug). Includes power cable. Such as battery, ac adapter etc. We will very appreciated for your doing. We work with a good quality supplier and factory. Help you and us save money greatly. Sony Vaio VGN-NR Series. Sony Vaio VGN-S3 Series. Sony Vaio VGN-S4 Series. Sony Vaio VGN-S5 Series. Sony Vaio VGN-SZ Series. Sony Vaio VGN-FW Series. Sony Vaio VGN-Z Series. Sony Vaio VGN-C Series. Sony Vaio PCG-FR Series. Sony Vaio PCG-GRS Series. Sony Vaio PCG-GRX Series. Sony Vaio PCG-NV Series. Sony Vaio PCG-R Series. Sony Vaio VGN-A Series. Sony Vaio VGN-AX Series. Sony Vaio VGN-BX Series. 100% compatibility with the original. UK 3-PIN POWER CORD NOT INCLUDED. DC Output: 16V - 4A - 65W. if any problem. ITEM INTRODUCTION. e.g. you can use 4.74A instead of 3.42A and it will not harm the laptop, as laptop uses only what it requires. In any circumstances our maximum liability will not exceed more then the original price paid. Type: Laptop AC Adapter. 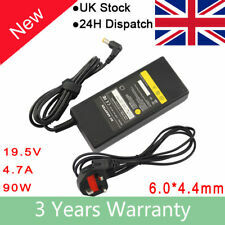 Adapter Output: 19.5V 4.74A. Adapter Input: 100-240V~1.5A 50-60Hz. Laptop adapters from various other adapter manufacturers can be used as long as the specifications are similar to the existing adapter. Sony Vaio VGN-E Series. Sony Vaio PCG-7. Series. Sony Vaio VGN-SR Series. Sony Vaio VGN-C Series. Sony Vaio VGN-NS Series. Sony Vaio VGN-AX Series. Sony Vaio VGN-FZ Series. Sony Vaio PCG-NV Series. 1 X AC Adapter. 1 X Free UK Fuse Power cord. Output power: up to 90 watts. Input: AC 100-240V 50-60Hz, Worldwide. Output DC connector:7pcs, detachable. Your reliance and supporting are our great honors. Output: 19.5V 4.7A, 90W. SONY VAIO PCG-3C2L. SONY VAIO PCG-51411L. SONY VAIO PCG-51412L. SONY VAIO PCG-5G2M. SONY VAIO PCG-5G3l. SONY VAIO PCG-5J2L CR220E. 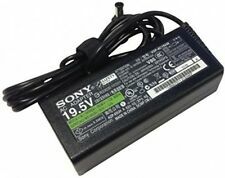 SONY VAIO PCG-61313L. Compatible Product LineFor Sony VAIO,VAIO. 1x Adapter with free cable. Input: AC 100-240V, 50-60Hz Output: DC 19.5V 4.7A. Such as battery, ac adapter etc. (Apply for Battery Only). Power:90 W. Factory price,Best quality,Good Service. Colour: Black. AC Input: 100~240V / 50-60HZ. Power: 90w. POWER CORD is included. Compatible Models: PCGA-AC19V PCGA-AC19V1 PCGA-AC19V2 PCGA-AC19V3 PCGA-AC71 PCGA-ACX1. Compatibility List. (not included). UK & EU CE RoHS FCC Approved. if any problem. e.g. you can use 4.74A instead of 3.42A and it will not harm the laptop, as laptop uses only what it requires. 1 X AC Adapter. Input: AC 100-240V 50-60Hz, Worldwide. We have the best aftersales service. There are no exceptions! Your reliance and supporting are our great honors. 1 X AC Adapter. We have the best aftersales service. There are no exceptions! Your reliance and supporting are our great honors. Power: 90w. AC Input: 100~240V / 50-60HZ. Plug Type: 3pin (UK). POWER CORD is included. 1 X AC Adapter. Output power: up to 90 watts. Input: AC 100-240V 50-60Hz, Worldwide. Output DC connector:7pcs, detachable. Your reliance and supporting are our great honors. 1 X Free UK Fuse Power cord.